For anyone who partakes in recreational fishing, statements such as "enhances quality of life," "preserves natural resources" and "contributes to the U.S. economy" do not come as a surprise. These are indeed the conclusions of the last angling survey conducted by the U.S. Fish and Wildlife Service. What may come as a surprise is that more than 40 million Americans fish each year, surpassing many other popular recreational pastimes. In many ways, fishing continues to follow its roots as a basic outdoor activity that is still accessible to people of all ages, requires little equipment, and can be enjoyed together as a family. On the other hand, advancements in both gear and technology, such as, depth finders, braided line, scented lures, etc., have increased the chances of anglers to locate and land their favorite sport fish. 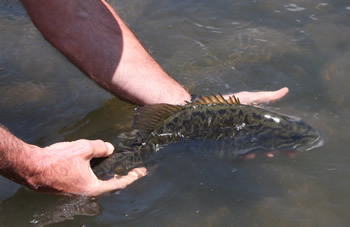 In addition, anglers are able to learn new techniques and skills for maximizing angling success through magazine articles, TV shows, and online videos. Because of these advancements, there is a greater potential to catch more fish in a shorter period of time, thus increasing the need to manage sport fisheries sustainably. If each angler made a few simple adjustments to help conserve the fishery and keep Illinois waters healthy, this could go a long way toward protecting our valuable waters. In this section of IFish, we have provided guidelines and materials that promote and educate the angling public to be active stewards in protecting our fisheries and preserving this resource for future generations.